Client: Walters Land (Rogerstone) Ltd. In 2012, Walters acquired the 40 hectares site of the of former Novelis Aluminium Works in Rogerstone, South Wales. Working closely and collaboratively with a team of specialist consultants, we obtained outline planning permission for the site within 1 year from acquisition. This was despite significant risks associated with the sites former use, its position immediately adjacent to a major river and initial opposition from the local community. The predominantly residential development includes 1,200 two or three story houses, a restaurant, hotel, retail area, school, playing fields and extensive public open spaces. The project reflects well on the multi-faceted nature of Walters as a civil engineer, design and build contractor and developer. Following outline planning approval, Walters undertook a 5 year transformational programme to turn the site into the high quality and desirable development that exists today. 95% of the physical works were delivered in-house using our own people, plant and resources. In 2018, the project was shortlisted for ‘Project of the Year, Civils’ by Constructing Excellence in Wales. The shortlisting reflected the way in which Walters used positive communication and collaboration within the project team, with project stakeholders and with the local community. 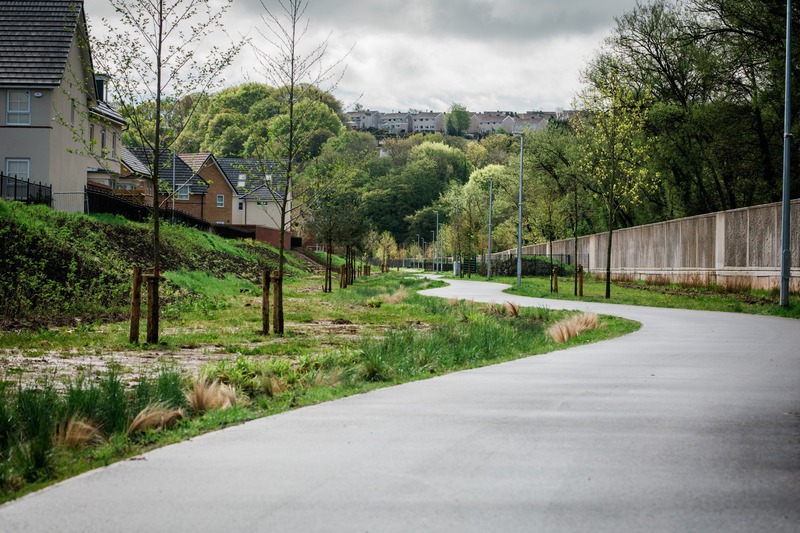 This approach, born out of our collaborative approach to civil engineering, led to the development being notably successful in terms of its speed, the quality of product and the benefit on the local community. 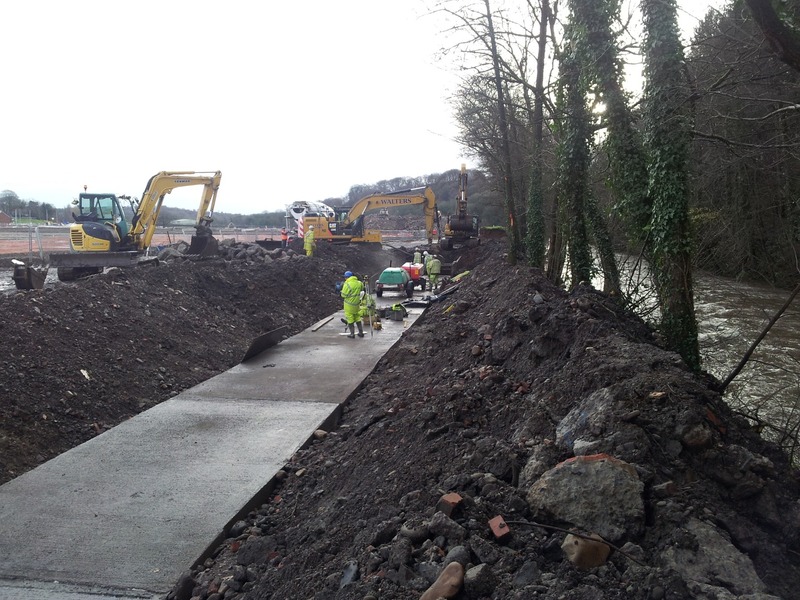 Following site clearance and the treatment of invasive plant species, the site remediation strategy required the breaking out and processing of 125,000m3 of reinforced concrete slabs, foundations and basements to a minimum depth of 2m. In order to ensure a fully remediated site, all made ground beneath the former buildings was excavated and re-compacted to a depth of 2m, requiring over 600,000m3 of earthworks to achieve design profiles. 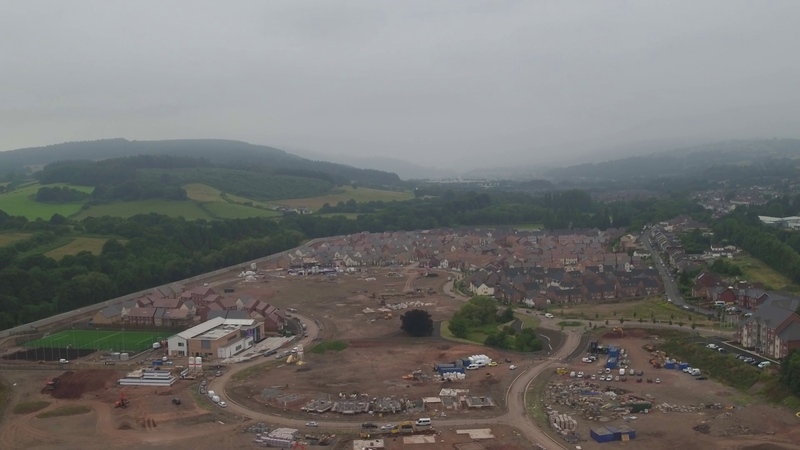 A high water table, the proximity of the River Ebbw and the presence of contaminated soil and groundwater necessitated careful management of ground risk. Active management in the form of storage and treatment of soils and water was used. This was combined with a design that favoured construction methods that avoided deep foundations and promoted systems that avoided man entry such as precast drainage. The 1.6km long mass concrete flood wall constructed from over 16,000m3 of concrete was sympathetically designed as part of a ‘linear’ park that separated the development from the river. This park doubled as the ultimate protection from extreme flood events. The wall was constructed using cyclopean concrete, recovered from the former brownfield site, reducing the carbon impact of the wall by 20%.